Like all great empires in human history, Kolkata biryani scenario is changing and rapidly. Earlier one of the icons in Kolkata used to be Biryani, Kolkata style biryani with one big piece of attar-flavored potato. And most of the people in Kolkata, having not tasted any other variety of biryani, swore by it. But, things are changing. 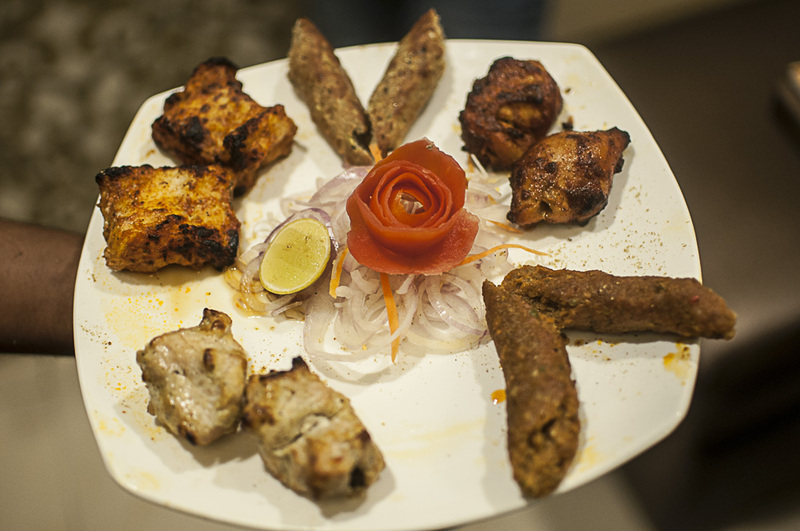 Kolkata palette is opening up to other varieties of the biryani, definitely for good…. Now, Kacchi biryani is one very popular (not in Kolkata) type of biryani where raw marinated meat and rice are cooked together… hence the rice gets the fantastic aroma of meat from the degh (handi) itself. 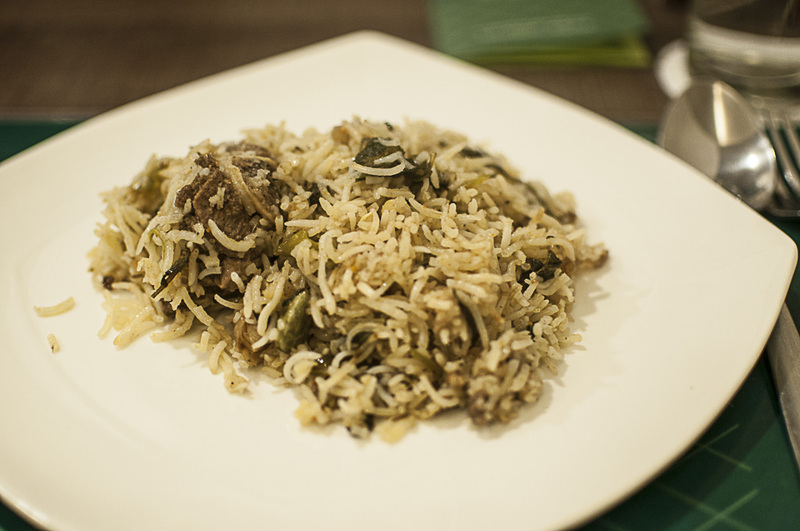 As raw (kacchi) materials are cooked at one time, the name kacchi biryani followed. 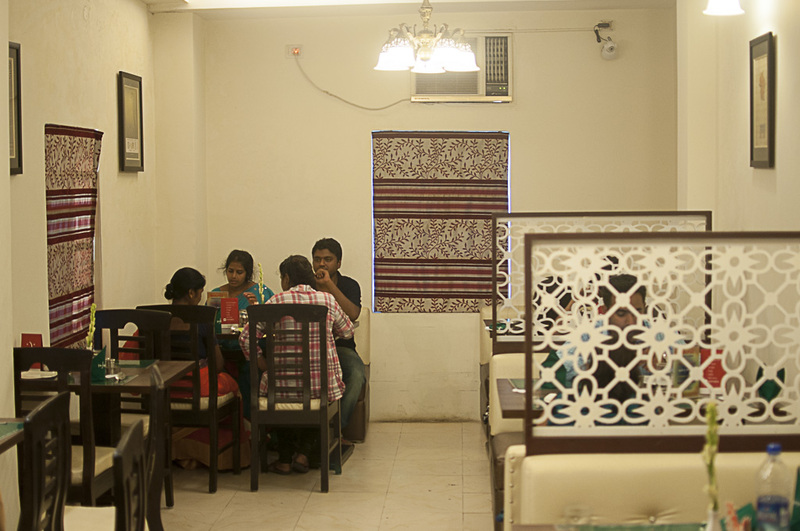 We were surprised to get invited to a place in the extreme south Kolkata (Behala) for biryani. I mean, I am seriously surprised. 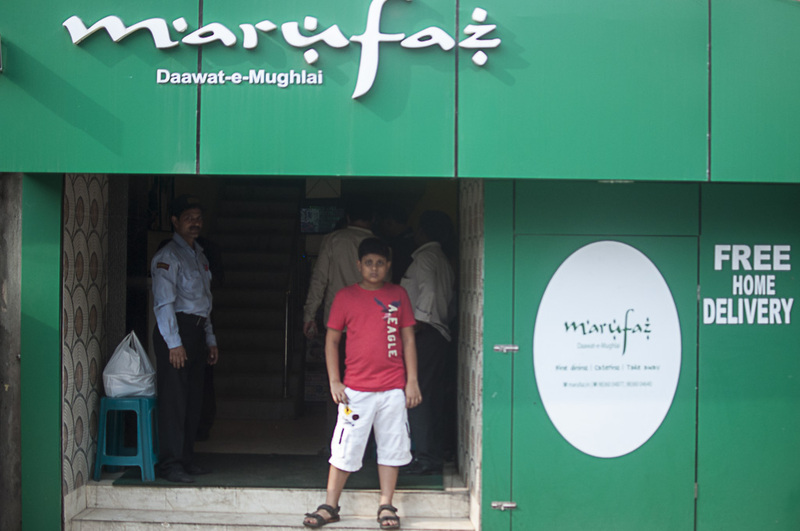 And, tucked in just the opposite lane of behala Ajanta cinema hall, after 2-3 shops on one’s left, lied this joint called Marufaz. Frankly, its a newbie in the Kolkata biryani scenario, but as some juniors have got their senses matured, the same story happened here. The outlet seemed modest enough, non-AC ground floor and take-away. But, thankfully, the first floor AC section is quite spacious, and a decent sitting. We were presented with the menu card along with a summer cooler mocktail (they don’t serve hard drinks here). 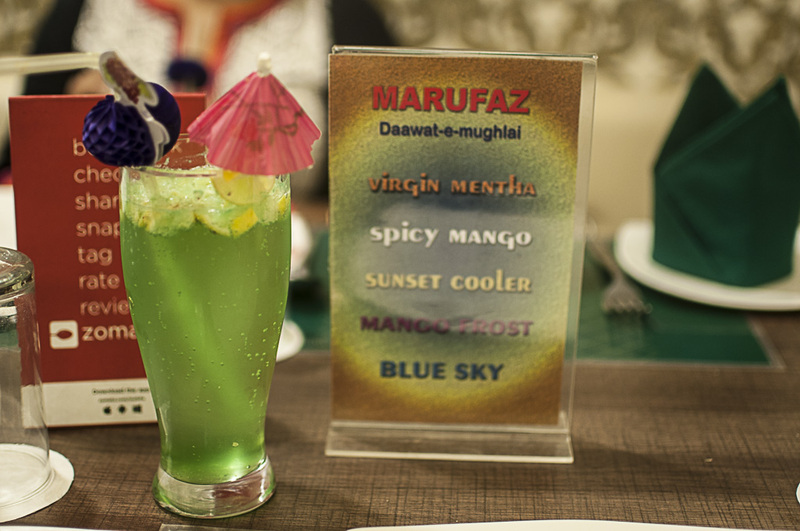 On a hot sunday afternoon, the mocktail was gulped down in a flash. 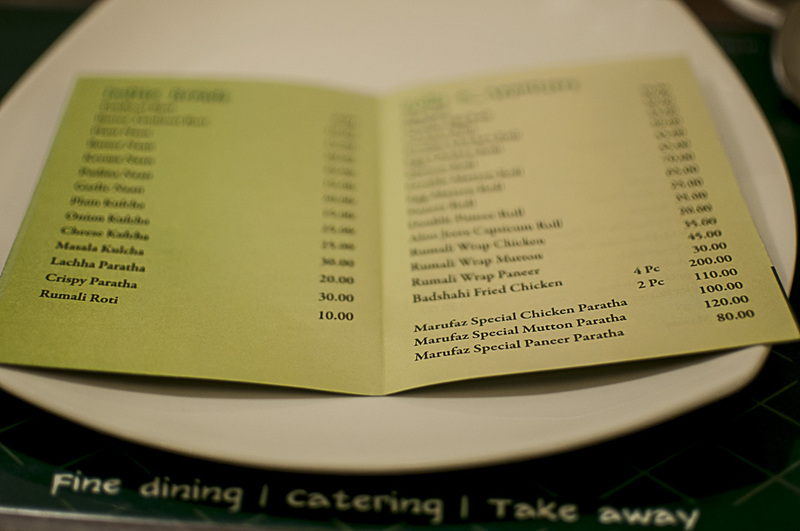 However, in the menucard, I could find some unusual items- Like chicken paratha and mutton paratha among others. Probably, they didn’t have it that time, but I would definitely com back hunting for it…. And if its anywhere related the the stuff we get in old delhi paratha-wali gali, I am blessed. However, sooner than we expected, the kebab platter arrived. Its good, but nothing great. Mutton and chicken sheekh kebabs were perfect, but the chicken reshmi tikka probably needed a little more marination time. Mahi tikka was good, and they use a good quality imported Basa. Like all good kolkattans, we were eagerly waiting for the biryani. 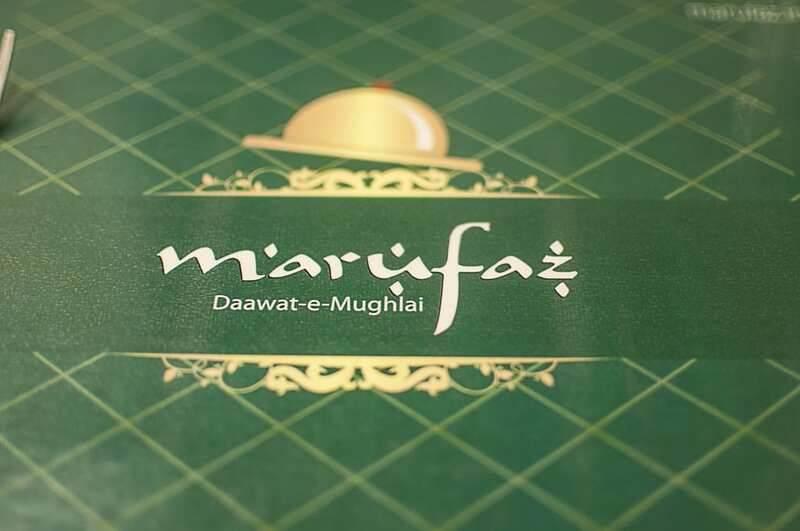 And, as per the suggestion by the owner Mr. Asif M Shah, we ordered Kacchi Biryani. It arrived finally and boy, we were just bowled out by the sheer look of it. Portion-wise its fantastic, much better than other joints (considering the famous taratala one) and the next thing that hit us was the aroma. It was punched with the combination of pudina, dhania leaves, slit green chillies and those nice, long grained basmati rice was having the smooth aroma of meat. A little spicy, but heavenly dish. The gave 2 pcs of good sized meat and (thanfully) no potato. Ad at 160-180 Rs a plate, its DEFINITELY value-for-money. Please forgive me. I just forgot to click good pictures and almost jumped on the thing. Thankfully, they didn’t serve green salad here with Biryani, which I hate (I am unable to understand how chewing some onion and cucumber adds to the biryani taste….. Anyway, its personal choice). 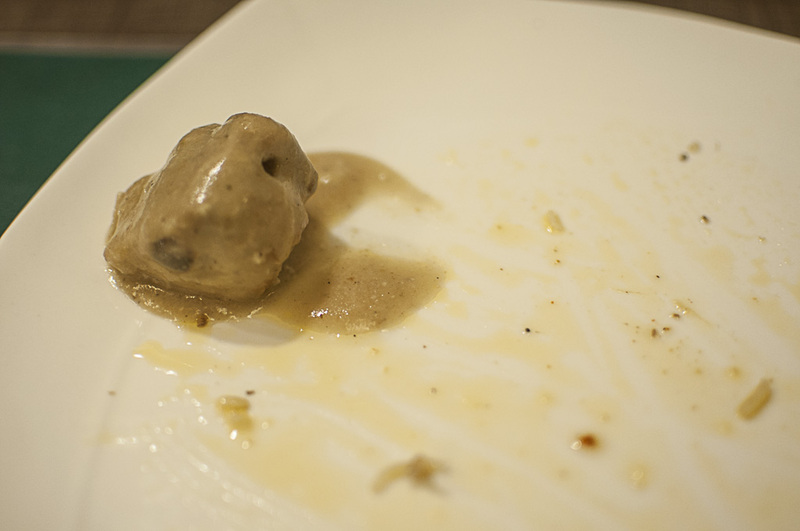 Instead, they served a glass of good quality Burhani. 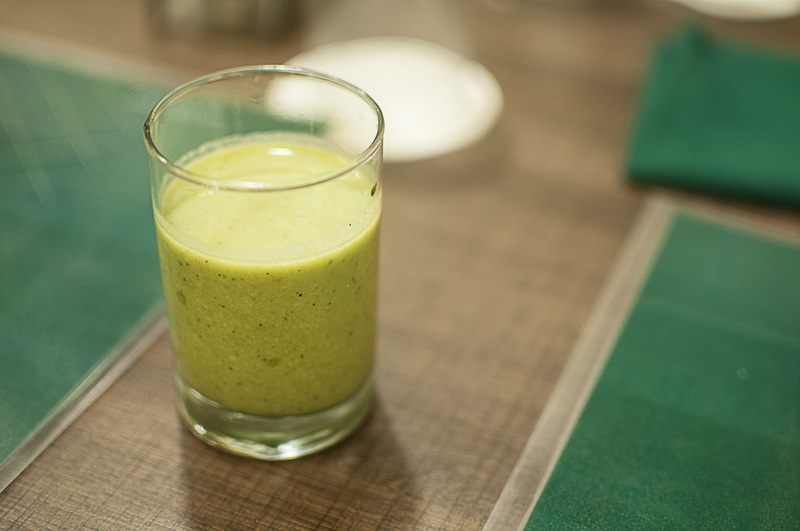 Burhani is normally a ghol/ Lassi flavored with garlic, kalonji, roasted cumin seeds, little pudina and what not. Its basically used as to clean the palette after the rich biryani. It was good, but frankly, I didn’t need anything after this heavenly biryani. Along with biryani, we got some chicken reshmi butter masala and bread basket. Here is another surprise for us. The chicken reshmi butter masala is made using creamy yellow gravy and the chicken is surprisingly smooth and soft. Loved it. Bread basket was a regular one- nothing special. But, after every damn thing, the insider glutton in me was craving for some more of the biryani and I packed some for dinner at home. They do a free home delivery within 5 kms, but sadly, our house is far than that. Somewhat religiously, we ended up with the zafrani phirni. nice, but the problem is, once you’ve met the maestro (kacchi biryani in this case), everything else seems pale. 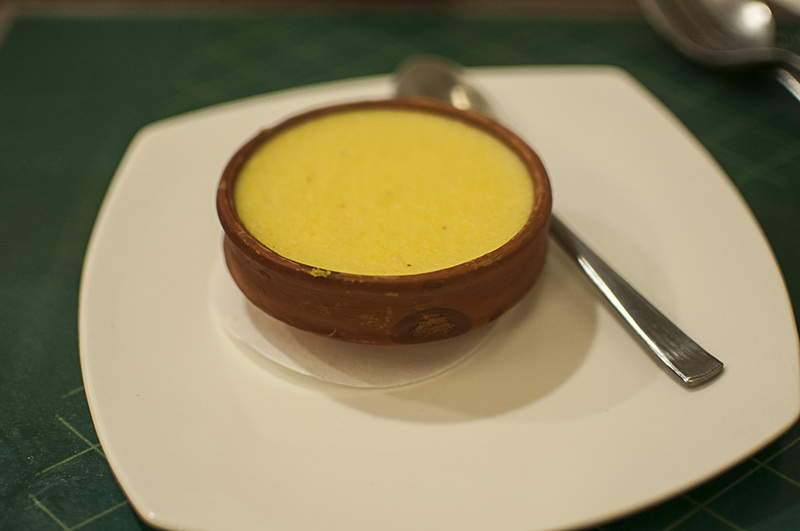 Not demeaning the phirni in any way, its pretty decent. But, personally I feel next time, I’ll fill up my stomach with some more of their biryani. They make one chicken tikka biryani, but probably that will be there for the next time. Till then, taste it and you won’t regret the choice. Wow, a hidden gem! Foodies will bless you for introducing this one. in fact that’s one of the reasons people read blogs. Yes, this biriyani at this price sounds great value for money. Would’ve probably tried alone had it not been that far. Can we go there one Saturday? Super, a little light on restaurant timing will be appreciated.